BTW – please “Like”this article using your favorite social media accounts – thanks for that. See here for the TV Schedule for all countries. Who’s taking it home? So how do they do it? I was watching it on Sunday – the wind was at about 15 knots, yet the boats achieved 43 knots angling downwind and 25 knots angling upwind. Wow – this is the most impressive thing in yachting. The engineering design effort and atmosphere over the past three years must have been intense, ground breaking and so innovative. This is the stuff that engineers and yachties live for. Even if it is to sit back and just watch (eyes wide open). Back to the question – how do they do it? Now that we’ve been seen to remove the drag factor almost entirely by introducing the foils and getting the hull out of the water, we’re seeing that the limitation on boat speed is not hull design or even wind speed as one might have thought. It comes down to the angle that a boat can go into the wind. It is the wind shifting forward as a car accelerates. The wind that the car feels is the shifted wind – called the apparent wind. “Apparently” this is what the car feels. So, same on a boat. The boat feels the new wind generated by it’s own speed. Unless it is stopped dead in the water, a boat will never feel the actual true wind. But the limiting factor is how much forward force can the winged sail garner out of the wings from the angle between the boat heading and the direction of the apparent wind. That angle can never be zero else the boat would be moving straight into wind and that’s not possible under these universal laws. The lift or forward component of the force to drive a boat forward relies on this angle. In traditional sailboats, this angel is about 30 degrees off the apparent wind angle. As an extreme example, ice sailing sleds with vertical wings and only thin blades touching the ice can achieve an 11 degree angle off the apparent wind. Airplanes with an asymmetric wing shape can gain lift with around 5 degrees off the airflow. Now with hydrofoils mounted on the Americas Cup AC72 sailing catamarans, we’re seeing sub 20 degrees off the apparent wind. With few rudimentary calculations then and with out calling the design teams at Team New Zealand or Oracle I calculated that the apparent wind must be about 19 degrees on a downwind angle and about 16 degrees on upwind. This was done by observing their tacking and gybing angles and plugging it all into the sine and cosine formulas. These formulas solve for the following obtuse triangle. We observed the true wind speed, the boat speed and the angle off the wind and thus we solved for the remaining. Given these formulas, there was no other solution than to come up with about 19 degrees of apparent wind heading downwind and 16 degrees apparent wind heading upwind. You might have also observed how tight in the sails were trimmed in the “downwind” heading. They were tight – even the non-winged headsail. This means the AC72’s were on a close haul heading downwind. Messes with your mind doesn’t it. Now there are a lot of other factors that play into all this like sideslip, tide, etc and I’ve not done those calculations so please consider this as completely rudimentary. I only have a Masters in Engineering – and you can bet a whole pile of dimes that a PhD guy will come back to me on a full explanation. With all the equations and diagrams – please do – I’ll publish it here – so long as it’s not too complicated. What I’ve attempted to do is explain the question presented above. How does an America’s Cup AC72 go faster than the speed of the wind? Here is an animation of the AC-72 performing tacking and gybing maneuvers. Watch the wind vectors through the maneuvers and also watch the boat speed increase as it bears away. BUT WAIT – Look at the Apparent Wind! What I’m seeing here is that the apparent wind vector is shorter than the boat speed. 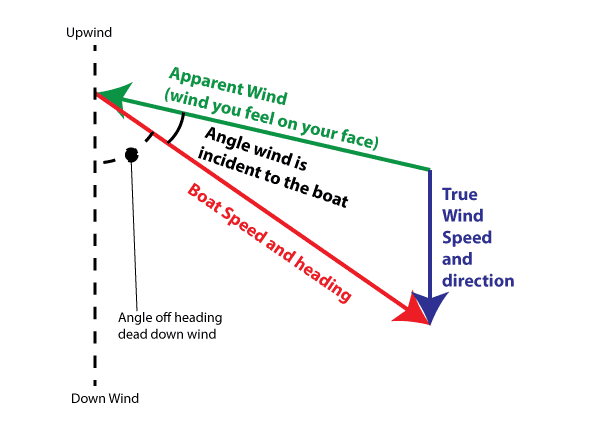 How can that be – the apparent wind speed less than the boat speed? Huh? Well actually who cares? Wind is just a force – it does not matter its speed. You now have to release your self from the boundaries of old monohull sailing with big hull drag. The only factors we are now dealing with is drag from the hydrofoils and the force that the wings can eek out of the wind it sees. As the apparent wind gets closer and closer to the front of the boat the accelerating force reduces. As the boat speed increases, the drag force increases. The boat will stop accelerating only when the drag force = the accelerating force. The following animation shows the drag force increasing with speed and the accelerating force from the wings reducing. Note that there is a step jump down in drag force as the boat begins to hydrofoil. Had the drag force equalled the accelerating force before the boat hydrofoiled then the boat would not continue to accelerate. So there you have it. With limitations on our minds now removed – you can see that boat speed can just keep on increasing and increasing until the forward component of the force from the wings equals the drag force on the boat. As the boat gets closer and closer to the apparent wind angle the forward force component reduces. 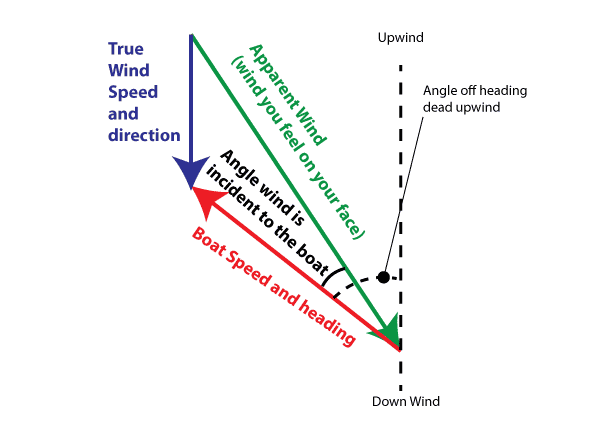 True wind speed matters only in that it helps to get the boat up on the foils but at high boat speeds, by looking at one of the vector diagrams above, an increase in true wind speed will only marginally help to increase the apparent angle which marginally increases the forward forces. The biggest revolution has come from the introduction of the wing being able to gain lift from closer angles to the apparent wind AND in a massive reduction in drag. Think about drag next time you’re towing a dinghy behind your cruising boat on a close haul. This requires an increase in force and the only way then to maintain speed is to bear way – whoops. With all this, I couldn’t help it – I’ve thrown in a basic (very basic) interactive animation of AC72 going around the course showing the above diagrams at strategic points around the course. 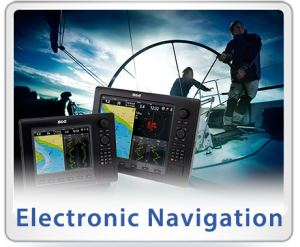 If this really got your juices going then I highly suggest our Electronic Navigation Course.